Felipe Massa intends to finish the season with Ferrari without worrying if he has a future with the Italian team. Ferrari are leaning towards sticking with the Brazilian, 31, for 2013 but Force India drivers Nico Hulkenberg and Paul Di Resta are still options. "Of course my future is important, but right now it's the results that are the most important thing," said Massa ahead of the Japanese Grand Prix. "The best plan is to race without worrying about the future." Ferrari have narrowed their choice for Fernando Alonso's team-mate next year down to three drivers. But Massa has reignited his chances of keeping the seat with some strong performances in recent races. In the last month, Massa has finished fifth in Belgium, fourth in Italy and produced a strong comeback drive in Singapore to finish eighth after a first-lap puncture put him to the back of the field. He is currently 10th in the overall driver standings. "I know what I can do, what I can give to the team and what are my talents," said Massa. "The team also knows this, because I've been here with them for rather longer than a day or even a year! "I have to concentrate on each race as it comes." Ferrari want to wait until at least mid-October after the Korean Grand Prix before deciding. Both German Hulkenberg and Scot Di Resta have produced impressive performances this season. In mid-summer, Ferrari were planning to drop Massa, who has been racing for the Scuderia since 2006. 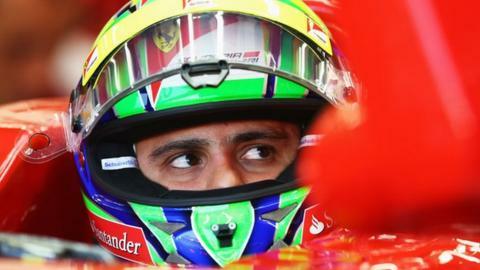 But BBC Sport understands that Ferrari team members want to keep Massa - as does Alonso, who made his views clear with a comment at the Singapore Grand Prix. Alonso said: "We need to have a driver that respects Ferrari and the tradition of this team. We work for the team and the red cars. This is the first priority. "And second I have been working with Felipe three years now and [we have] a good relationship. If the team decide to change Felipe, whoever [comes in] has to be better than Felipe. "Of the names that have been written, I don't know if they have been written with the head or the heart. I don't know if you can compare what Felipe did in F1 with what they did." That last remark is a reference to the fact that Massa has won 11 grands prix and narrowly missed out on the world title in 2008, whereas none of the drivers who have been linked with replacing him have yet won a race. But Ferrari's bosses want to wait a little longer before confirming Massa to be sure he can hold on to his current form.